There was a time when only the 1 percent learned to read, but in the 19th century a movement for universal literacy took hold. Though this global effort is still a work in progress (even today illiteracy is enforced culturally, religiously, politically and economically in many contexts) it has dramatically changed the world. This transformation has not been easy or magical. Like every movement, this far-reaching campaign challenged the injustice and debilitating inertia of the existing order. It resisted the systems that benefited from the literacy monopoly and slowly established the right to read as the default. As McCarthy’s student infers, we are as much in need of nonviolence education today as we were of literacy training a century ago. To extend this analogy a bit further, systematic nonviolence literacy — teaching the principles and practices of nonviolent power — offers options beyond passivity, on the one hand, or more violence, on the other. Most of those who have participated in the nonviolence trainings I’ve been part of over the years have been in their late teens and on up. “Training” in this context is a slight misnomer. By the time we hit our teen years we’ve already been trained deeply in the ways of violence. From then on, our violence training is often reinforced by virtually daily refresher courses, which tend to undermine our potential for nonviolent alternatives and to feed a belief that nonviolent change is impossible. Nonviolence education is thus less a form of “training” than of “re-training”: deconstructing and reframing deeply ingrained patterns, attitudes and behaviors. Is it possible, though, to start this kind of peace education early enough to provide children with a durable foundation not in violence but in nonviolence? That is, for nonviolence to begin as the default? This is a thorny issue for many reasons, including the tenacious nature/nurture debate, which has sparked a recent cottage industry of research on topics like empathy and forgiveness. For my purposes here, I will sidestep wading into this thicket, just as I will give no more than a passing glance to the growing proliferation of K-12 peace studies curricula and programming. Instead my attention here is drawn to what one could call “toddler” nonviolence training. Even before kindergarten — in fact, even before pre-school — there seems to be a quiet peace-building movement afoot. How do I know? I’d like to say that I’ve done copious, systematic research in which I compiled an extensive database of cases and curricula and then devised clever instruments for evaluating them. This, though, isn’t the case. Instead, my expertise in this arena rests entirely on the fact that virtually every weekday morning I take my two-year-old daughter, Leah, to toddler classes. Chicago, our hometown, is studded with hundreds of parks with hundred-year-old field houses that, no matter the weather, are crowded every morning with innumerable toddlers and their parents. While the sessions are called classes, “the pedagogy” steers toward creativity, self-expression, adventure and fun. There’s structure (free play, music, art project, snack), but just enough to allow great helpings of spontaneity. There’s alone-time — what seems a kind of freeing and freewheeling self-possession — and group activity. All of this, you might say, is what one expects of two year-olds. But what has struck me, being immersed in this space over and over again for the last year-and-a-half, is the lack of chaos and conflict. Most of the children, it seems, have not been schooled in the mechanics of group conflict yet. When conflict happens (someone takes another child’s toy or one child pushes another) there’s a kind of awkwardness to the vignette, as if the script of conflict is unpracticed, tentative, uncertain. Most of the time, though, conflict isn’t what transpires. Instead the environment is hyperactivity personified, but a hyperactivity that has an unexpected lack of anxious tension and pre-loaded expectations of conflict or violence. If my reading of this is right, the toddler nonviolence formation program I detect here is built largely by the children themselves, with just enough guidance and cues from the teacher (Ms. Margaret, Ms. Laura, Mr. Tim or Ms. Valentina, as the case may be) to give them space to make this super-charged serenity a reality. From Benjamin Franklin’s Poor Richard’s Almanac to Steven Covey’s Seven Habits of Effective People (not to mention the ethical prescriptions of many of the world’s religions before and since), we have been presented with lists of suggested action for right living. This poster sports a stellar set that, I have no doubt, would have left Gandhi beaming. 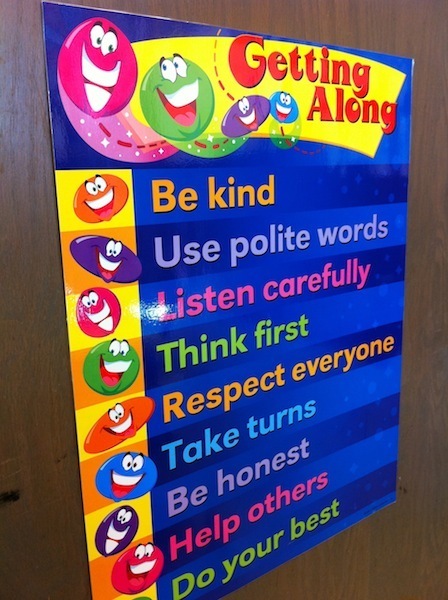 While there was some overlap with the first list, this set seemed a bit more focused on maintaining order (directions and cleanliness), while still highlighting interpersonal peace (sharing, listening, cordial speech, and, like the first poster, taking turns). Violence has had its turn… and it isn’t working. 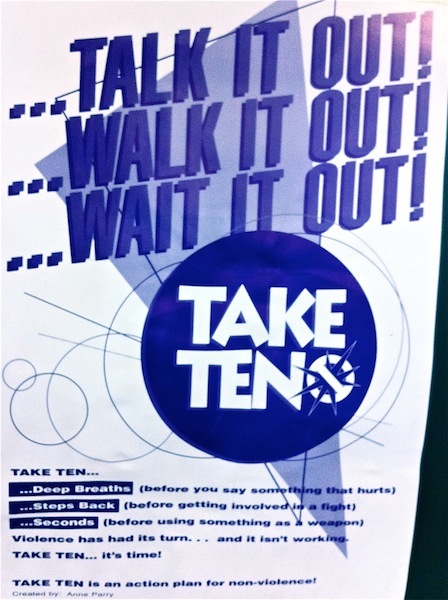 Take Ten… it’s time! What? 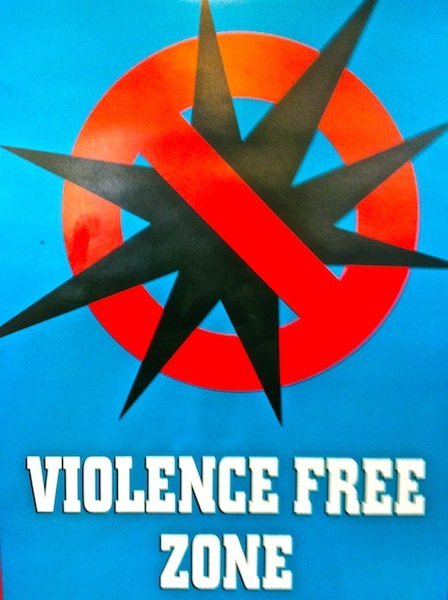 The field houses of Chicago are promoting an action plan for nonviolence that critiques violence — because it doesn’t work — and then gets specific about tactics? Breathe deep (center oneself), step back (create spaciousness and see the bigger picture), and count to ten (not simply to lower your blood pressure but to give you time to think before reaching for that trusty weapon). After encountering this latest specimen, I began to ask, “Who is the intended audience?” After all, even the most precocious kids here aren’t reading yet. So maybe it’s for some of the older kids who use the building at other times of the day? Maybe it’s for the parents, or even some of the employees? In the end, I came to this: These tactics and prescriptions amount to a vision woven into this space. They comprise an intention, a blessing, a wager. To those who can read, they are meant literally. To those who cannot, they are a promise that the rest of us can deliver, so that the peaceableness that is still percolating in these two-year-olds can be nourished and deepened. Each of these spaces is a house of peace where toddlers practice peace in their inmost being, while those who have passed this stage can perhaps reconnect with this spirit and build on it in a world of violence and injustice. So what can this say to the rest of us? Some years ago Robert Fulghum published a bestseller entitled All I Really Need To Know I Learned In Kindergarten, which also offers some of the wisdom I have encountered in Chicago’s field houses. What my small-sample, anecdotally-based study suggests is that this learning starts at least two years earlier. The question is what we do with this when we enter what we claim is the real world. These are the potential building blocks for a culture where everyone matters. We are thus called to build movements that put these guidelines into practice and even try to recreate the atmosphere I have discovered in the Chicago field houses: creative, expressive, adventurous, and — dare I say it? — fun. Nonviolence literacy may start at two years old, but it will flourish only if we read the world in a new and transformative way. If we taught nonviolence to younger and younger children in a caring way, there would be a major impact on society. I have been a preschool and infant/toddler teacher for over 35 years. Before that I was full time activist for War Resisters League and nonviolence organizer. When in India for War Resisters International Triennial, I met a young Gandhian activist who asked me why US activist spend so much time getting arrested and so little time developing nonviolent alternatives. Experiments in nonviolent education for preschool age children are few and far between. Gandhi and his followers set up preschools at their Ashrams and had children intergrated into the life of the community and their campaigns. Thanks for introducing this topic! Love it! Fred Donaldson (www.originalplay.com) has spent 37 years teaching play around the world, as a way of bringing nonviolence. Fred sees the teaching as going in both directions, though – he says he learned to play from playing with young children and wild animals. Nonviolence is innate; it’s just that we teach violence so early, and all have some unlearning to do. The learning Fred describes is bodily as well as conceptual, and Fred says he’s been “rewired” so his love reflex is faster than his fight-or-flight reflex. Nearly 30 years ago my former wife and I enrolled our daughter into a co-op preschool where the teacher showed us how to actually mediate post-toddler conflicts with five year olds. The techniques were like white light: with a skillful set of questions and listening skills, the teacher was able to help two preschoolers figure out their own nonviolent conflict resolution and then go on their merry way. Those techniques stayed with me and I am now the exceedingly proud father of a 30-year-old daughter who turned out to be a great human being, raised with honesty, respect, caring and fairness. I also used the interpersonal communication techniques I picked up at the preschool. Everything I ever learned I learned in co-op preschool with my daughter. Now that I am aware of negotiation, collaborative problem-solving, nonviolent communication, peer counseling and mediation skills taught by and to our youngest generation, I have both a hope and a purpose my old self could only dream of. A tip of my hat to grassroots nonviolence!